Rally-turned-rallycross driver Sloan Cox, from Rotorua, scored a pleasing third place in his first event in the rapidly growing Australian rallycross series over the weekend, gaining valuable experience to take into his next RX Academy round in Finland next month. 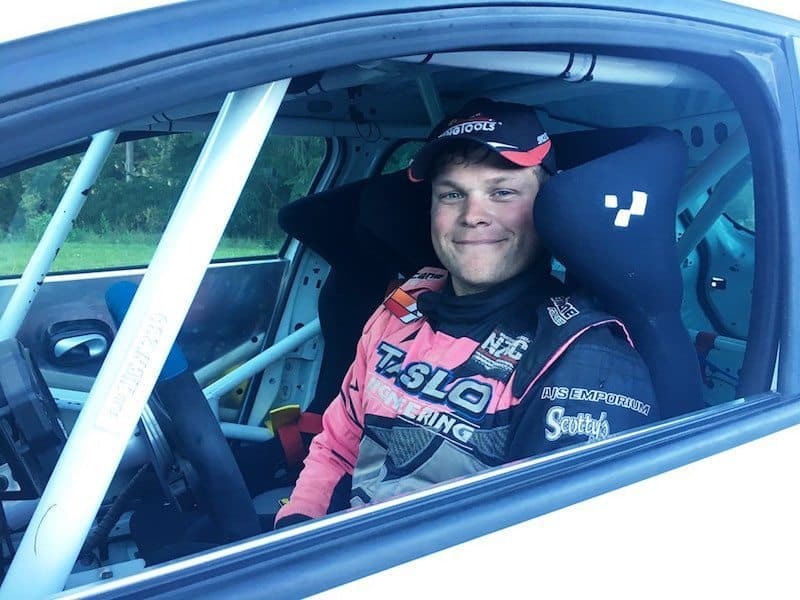 The 26-year-old is the only New Zealander competing in the Scandinavian RX Academy, a five-event and coaching programme designed to help competitors develop a career in rallycross, one of the fastest growing forms of motorsport. Offered the opportunity to also contest a round of the 2018 Australian Rallycross Series (RXAus), Cox was keen to gain further on-track experience in rallycross, particularly in a front-wheel-drive car similar to the one he uses for the RX Academy. “It was another big weekend of learning,” says Cox of the Australian event held at Marulan circuit about two hours south of Sydney on 27 May where he competed in the Open 2WD class in a Ford Fiesta owned by Rallycross Australia director Justin Dowell. “There were five in our class and, for me, it’s about learning more about front-wheel-drive and how they handle on the tarmac sections of the mixed gravel and tarmac rallycross tracks. Cox says the event – round two of the Australian series – was run fast and efficiently. Sloan Cox enjoyed his first experience of rallycross in Australia. Third in the final heat, Cox was third on the grid for the semi-final, but finished fourth. “That race was six laps and the brakes were getting pretty hot. “Our crew sorted the problem so I could give it my best shot for the final. I started fourth on the outside going into the first corner. I stuck close to the back of the two Escorts who had the lead. When the driver in the Polo in fourth did his joker lap, I held off doing mine until a bit later, coming back into the main track close to the leaders and ahead of him to finish third. The whole strategy of rallycross, with small starting grids of five to eight cars, close side-by-side racing and the joker lap, is still new for Cox, so he’s been working hard on learning the specific race craft needed for the intense, short format of rallycross. “A big thanks for Justin Dowell for the whole weekend. He and Troy, who’s in the RX Academy with me, looked after me well. Justin owns quite a lot of the RX cars in Australia and leases them out. You can see that RXAus has really stepped up and become a lot more like European rallycross. “I’d love to come back and race here again, perhaps in one of our cars from New Zealand. Cox would be delighted to take out the RX Academy winner’s prize – a fully-funded drive in five European races in the RX2 International Series or a full season in the FIA European Rallycross Championship for Super1600. Following the June 16 round in Honkajoki, Cox has three more RX Academy events – 11 August (Jalasjärvi), 25 August (Kouvola) and the final on 7 October at Tierps in Sweden.